In the first of this month’s shows from the Strip! podcast team on ResonanceFM and online about the portrayal of masculinity in American comic books, Alex Fitch talks to writer Fred Van Lente about penning the adventures of undead superheroes in Marvel Zombies, bringing to light the exciting adventures of Action Philosophers from Aristotle to Derrida and co-writing Tales of the Incredible Hercules which depict the travails of the Classical demi-god on modern day Earth and beyond. Fred is the New York Times bestselling author of Incredible Hercules (with Greg Pak) and Marvel Zombies 3 & 4, as well as the American Library Association award-winning Action Philosophers. His other comics include Comic Book Comics, MODOK's 11, X Men Noir and Amazing Spider-Man. Wizard magazine nominated him for 2008 Breakout Talent and he's been called "one of the most idiosyncratic and insightful new voices in comics." The interview was recorded at Gosh! comics in Great Russell Street, London following a signing by the writer. Mantle Arts, a small UK based arts organisation, is running an interesting project to brighten up a town centre - and is looking for comics artists to get involved. The project is employing artists to create artwork for empty shop windows in Coalville, Leicestershire and is looking for submissions from sequential artists and illustrators. To apply, send them your CV, some examples of work (a web link will do) and a paragraph on what you might like to create for a shop window. Email submissions to matthewATmantlearts.org.uk. The closing date on the brief is 11th January but it might be worth contacting Mantle to se if they can extend that a little as on some online postings they've pushed that back to 15th January. Based in North West Leicestershire and working across the Midlands, Mantle Arts is a particpatory arts organisation creating arts projects, festivals, events and manage public art commissions. Fallen Angel Slips from Murky Depths! Fans of Luke Cooper’s The Dark Gospel series, which appears in the speculative fiction quarterly Murky Depths, who can’t get enough of the cigarette-smoking, alcohol-swigging angel, Halo Slipping, will be please to know that The House Of Murky Depths (Murky Depths’ publishing arm) has released a full-colour 32-page Halo story called Mengele’s Brain. The comic is currently only available from www.murkydepths.com and Orbital Comics in London. Also from The House Of Murky Depths comes a 36-page black and white comic from Nicholas Dishington called Shadowraith about a young female detective in search of a missing person. Very dark and demonic. The House Of Murky Depths will be launching Luke Cooper’s new hardback graphic novel in Orbital Comics on Saturday 27 March. It’s a collection of the story arc that has featured in Murky Depths from Issue #2 to Issue #11. That's also the last day of Nancy Farmer’s art exhibition in Orbital’s gallery. Nancy has been illustrating stories for Murky Depths since Issue #5. Bolstered by the sales success of an SFX comics special last year, UK publishers Future have announced a March launch for Comic Heroes, a premium-priced quarterly magazine title that promises to take an in-depth look at the latest superhero movies, videogames and of course, the comic books themselves – with news, previews, reviews and comprehensive features. Featuring all-new editorial on all things comics, the launch of Comic Heroes has been spurred by interest in superheroes at an all-time high, and follows the huge success of a “superheroes special” from sister-title SFX, one of the most successful specials in the seven year plus run of one-offs. Future’s Comic Heroes will deliver all-new editorial covering everything associated with the superhero universe and although the format is still even now being finalised, a Future spokesperson told downthetubes they also hoped to include preview comics from a variety of publishers as part of the package. Edited by Jes Bickham, whose previous credits include work on titles such as PC Gamer and N64 Magazine, Comic Heroes is the latest magazine launch from Future in music and film – specialist sectors where it holds strong market positions. “Our success in launching two new monthly magazines and a number of specials in 2009 was thanks to our in-depth knowledge and editorial expertise in the specialist sectors we launched into," explained Robert Price, Future UK Chief Executive. "We’re leaders in film and science-fiction media, so this launch makes absolute sense for us, particularly given the incredible popularity of the superhero genre at the moment. “The interest in superhero movies is at an all-time high," added Stuart Galbraith, Associate Publisher of Comic Heroes, and its sister-title SFX, "and with a massive slate of new movies in development it really looks as though we are entering the decade of the superhero – with new Batman, Captain America, Iron Man, Spider-Man, Thor and X-Men movies due within the next few years, as well as the forthcoming Avengers film which brings many of Marvel’s biggest characters together in one epic. “SFX readers have always maintained a healthy interest in superheroes but their recent special demonstrated an appetite from enthusiasts for more. The editor of British comics magazine Crikey! has revealed the recent collapse of Borders UK has proved a bit of a catastrophe for the magazine, as the loss of that chain and its affiliates took away about 70% of its distribution. No alternative distributive possibilities are available to the title at this stage, which means a 'regroup' for the title. The title's sales are too small for Diamond to consider distributing it, for example - and the money the magazine has lost from the Borders collapse means they can't currently afford to go into another high street chain. "So we're retrenching and regrouping and in the meantime going back to our old format for #13," says editor Tony Ingram in a post to the downthetubes forum, "but there is one bit of positive news; we've been adding content to the website at www.crikeyuk.co.uk, and we now have our own brand spanking new Crikey! forum there, too. "All are welcome, so please don't leave us talking to ourselves." • Marvel Entertainment stockholders approved the company's merger with Disney at a special meeting held last Thursday (31st December). Under the agreement, valued at an estimated $4.3 billion, Marvel becomes a wholly-owned subsidiary of Disney. Whether this will ultimately have any impact on Panini's license to publish Marvel material in the UK, given that Disney's preferred European publishing partner would seem to be Egmont, remains unknown at this time. • As well as acquiring Marvel, media site Cynopsis reports that Disney has developed its existing relationship with Stan Lee's POW! Entertainment (Purveyors of Wonder) by taking a 10% equity stake in POW! for $2.5 million. Disney entered into a first look deal with POW! in 2007, and under the new deal includes enhanced rights to the creative output of POW! and certain exclusive consulting services. • Is Apple's long-rumours iTablet about to be announced? The Financial Times reported that the company has booked the Yerba Buena Center in San Francisco on 26th January to make a special announcement to the media and is widely expected to unveil a tablet-style touch screen computer that presents videos, magazines and newspapers with a iPhone-like interface. The New York Times published some detailed titbits about the device just before Christmas, reporting that Apple supremo Steve Jobs is apparently very happy with the device - which may launch as iSlate. Apparently, if you have an iPhone, you’re carrying around a mini version of an early Apple tablet. Expect the first iTablets/iSlates to be shipped in March, according to this rumour round up. Andrew Luke has launched his strip blog, Don't Get Lost, which he describes as a 300-page tale of abuse and survival through the self and friendship. The tale begins as a man flees from potential violence at the hand of teen gang members, and the story so far reflects many of the worries and frustrations a lot of folk have in modern Britain. "I'll be posting seven pages a week in 2010," says Andy. Our belated congratulations to Anthea Bell for receiving her Officer of the Order of the British Empire in the New Year Honours list for "services to Literature and Literary Translations." 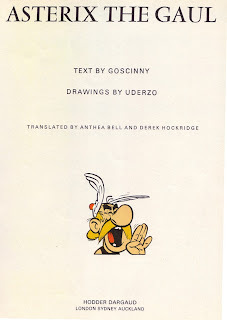 Anthea is best known to us for the English language translations of the Goscinny and Uderzo Asterix books along with her translating partner Derek Hockridge. 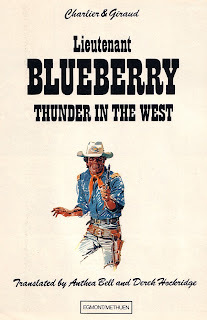 However the duo have translated many more bandes dessinees albums than just the Asterix books, from the cowboy adventures of Lt Blueberry to the Arabian humour of Iznogoud (now published by Cinebook). She discusses her work on the Asterix books in an excellent article on The Art Of Translation written for the British Council's website as well as her love of the character on the Asterix International website. In addition to these comic strips she has also translated many novels into English and is interviewed at Writer Unboxed about her work translating Cornelia Funke’s children's novels from German into English. However for us she will always be part of the translation team who turned a Gallic Bard, who's original name translated as "Comprehensive Insurance", into the wonderful Cacofonix.